Halkidiki , also Chalkidiki or Chalcidice, is one of the prefectures of Greece. It is located in the southeastern portion of Central Macedonia. The Cholomontas or Cholomon mountains lie in the northcentral part. It consists of a large peninsula in the northwestern Aegean Sea, resembling a hand with three "fingers"; Pallene (now Kassandra), Sithonia, and Agion Oros (the ancient Acte) which contains Mount Athos and its monasteries. 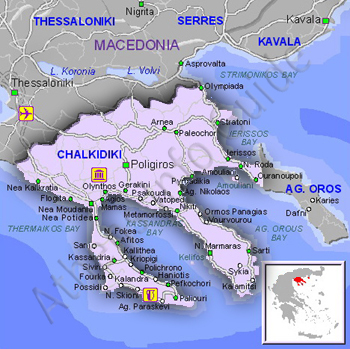 The capital of Chalkidiki is the city of Polygyros, located in the center of the peninsula. Its most populous municipalities are Moudania, Kallikrateia, Polygyros, and Kassandra. Its largest towns are Nea Moudania and Nea Kallikrateia.